Got some old furniture clogging up the loft? A cellar full of old CDs and "vintage" clothing? The usual route for these items would be either a trip to the local charity stop, or an eBay listing. 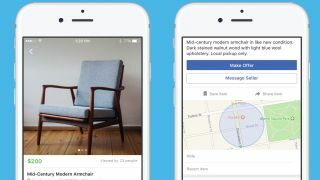 But Facebook is now making a play for your used goods with its new Marketplace feature. Building on the success of its Groups function, many of which already facilitate local trade between Facebook users, Marketplace is a new way for the social network's users to "discover, buy and sell items". With its own dedicated part of the Facebook app, you'll be able to post photos of your items for sale, descriptions and prices, as well as listing your items under a category along with your location. Anyone searching for an item will see the details, as well as a photo of the person listing the item. From there on in, finishing the deal is completely down to the seller and the buyer - you'll be able to discuss a deal and arrange a meet up via messages, without Facebook getting involved. It explicitly states that it "does not facilitate the payment or delivery of items in Marketplace." In other words, as it's not handling any money, Facebook isn't taking a cut of any sale, nor do you have to pay the social network a middle-man listing fee. It's a distinct advantage over eBay's listing fees, while offering the local attraction of the likes of Craigslist along with the added networked benefits of Facebook. Although it doesn't handle payments directly, Facebook recently added payment functionality into its Messenger app in the US, which adds another level of convenience when making payments. The feature will be rolling out to both Android and iPhone users in the US, UK, Australia and New Zealand over the next few days, provided they're aged over 18.